This Leatherman Skeletool review will provide you with an in depth look into the stylish Skeletool CX multi tool. It’s not your average multi tool but it’s definitely one thing – stylish. Compared to other multi tools out there, the Skeletool stands to be far better. The CX version of this tool is made of carbon stainless steel. Multi ﻿﻿tools are great – but not without the right criteria. There are plenty of manufacturers who make a lot of pocket knife tools in the market. But not everyone deserves consideration. So which ones do? First on the list is build quality. Multi ﻿﻿tools would be nothing if not strong and durable. It would be very frustrating if your choice of a multi tool suddenly snaps while you’re working. So it’s a must that you choose a multi tool that is strong and has a solid feel. Selecting a pocket tool which is ergonomic would be a good choice too. This ensures that you’re most comfortable whenever you are working with your multi-tool. A multi tool with a lifelong (or almost lifelong) warranty would be appreciated too. A stylish design, compact build, and competitive price are just secondary considerations. 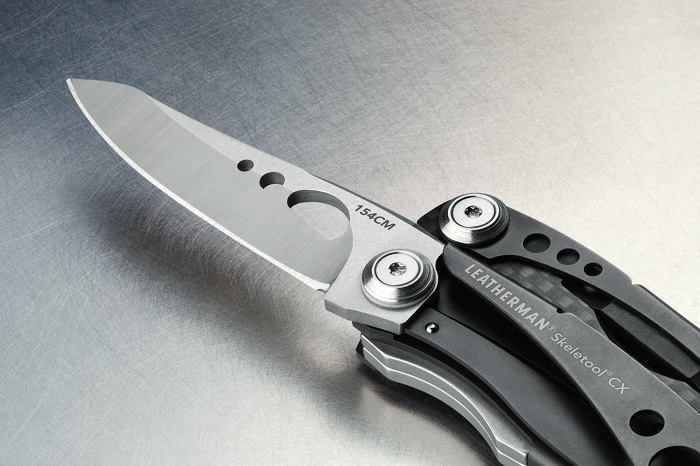 This Leatherman Skeletool review will check out the third generation CX Leatherman tool. Compared to the earlier Wave and Surge, the Skeletool is very unique when it comes to design. 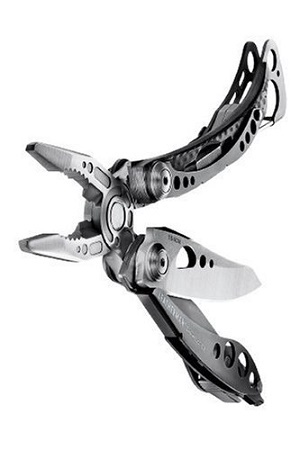 One, it takes an unusual look for a multi tool whether by Leatherman or from other brands. Two, the CX’s design is very refined even if its asymmetrical. Some multi tools are too big, while others are too small. The Skeletool CX just have the right size with the most essential tools you’d need for quick fixes and repair. Compared to its predecessor, the Skeletool, the CX uses carbon fiber instead of steel pieces for decorative purposes. But what makes the CX better is that its asymmetrical shape makes it easy to access all of its tools externally. The 154CM steel or “super steel” construction of the CX also makes it durable and very strong. It comes with a blade with a partially serrated edge which is very handy if you wish to do more than just one kind of cutting. The tungsten coating of the CX makes it resistant to oxidation and corrosion so you don’t have to worry about it getting rusty in a long time. The DLC or diamond-like-coating of the CX makes it scratch-resistant as well. So your CX tool is likely to look polished even if you often use it often according to one Skeletool CX review by a satisfied customer. For additions, the CX comes with a carabineer clip so you can attach it on your belt or anywhere else you might find handy. The fact that it doesn’t go overboard with tools makes it a good choice. Much more if you want a tool that gets the job done without all the heavy additions of more unnecessary tool pieces. The Skeletool CX is somewhat more expensive. But the price adjustment is well-worth it given its better value for build and performance. The Skeletool CX deserves praise because of its quality build and durable construction. Accessing all the tools externally is a very good point too since you don’t have to open the tool to get to the tool you need. The tool also has a crisp design and performs better than other smaller multi﻿﻿ ﻿﻿tools on the market. 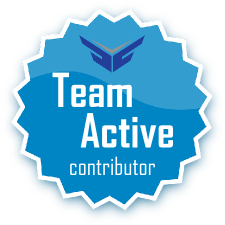 From this Skeletool CX review, we can say that some may not appreciate its very compact size especially if you need heavy-duty pliers to do the job. The limited tool options can be a downside at times – but this has only happened to me once and it was a very unique situation (portage canoe trip to an island and…well it’s a long story! We got the job done in the end!). Also, you may find it better if it comes with a sheath instead of the carabineer clip. The Skeletool CX is definitely different than its predecessor. The design changes paid off because the CX is better at everyday carry tool performance than other tools. It’s lightweight and robust for it’s size. I use mine every day without fail.